1) The map must be original, no ports of any SWBFII maps or copying of SWBFI maps. You can use any assets you find to create the map though. 2) The map must have stock sides. This is so that people can focus on the map design and not get distracted by the sides. 3) The map must be submitted by August 1st. That is more than 2 months so that you can create an amazing map! Now here is a couple things that might give you an extra +1 when the judges judge your map! 1) Give the GCW units their correct stock skins, last I checked the Rebels didn't wear desert clothes on Coruscant. In short, make a custom mission.lvl for your map. 2) AI pathing, hint nodes for AI involving snipers mine layings etc. No AI running into walls or getting stuck. Make sure the AI can fight an entire round of the map on their own in a reasonable amount of time. 3) A mini map and a movie at the map selection screen. Oh and I should mention that I think the most amazing Coruscant maps ever made are Rends Coruscant City and Streets. There you have it! 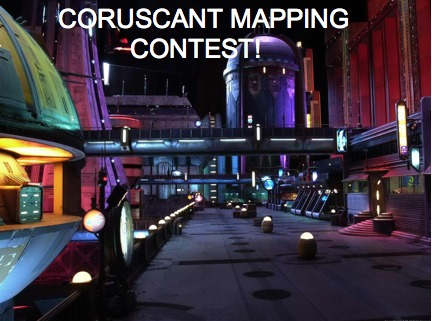 The Coruscant Mapping Contest, deadline August 1st. You may submit your map on swbfgamers.com, there is a larger SWBFI community present there.